That’s the one thing I have an eye on. But looks like there is no pressure o position sensing here. The cables look supercool, and this is the only positive thing I can say at the moment. it’s from Tobias Von Hofsten’s instagram. He works for T.E. 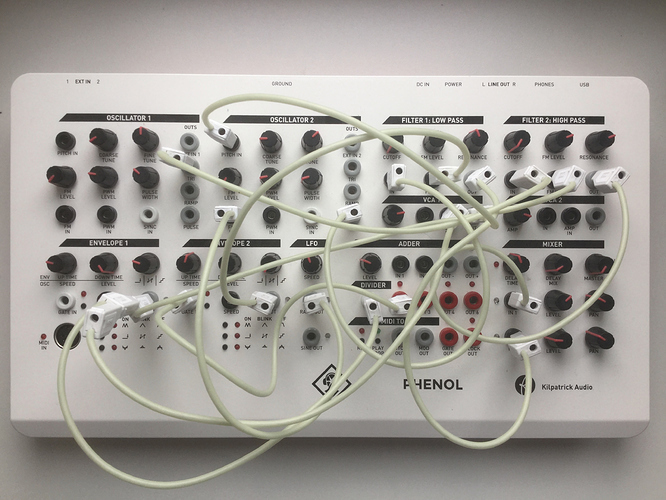 I personally enjoy complexity and weird design in modular synths but I absolutely understand and admire the approach TE is taking here to create simple, straightforward and fun system for the ppl who are just entering to modular. Something like the 400 can fit perfectly for the ppl with different skills and perception (except maybe with banana cables instead of TRS 3,5mm jacks) and can open up the modular world for totally different crowd. That is a wonderful thing. EDIT: but 3,5mm TRS patch cables, seriously??? Definitely the best demo of it I’ve seen. This seems great for learning and teaching modular. Within reach as a system for teaching kids/youth. Good demo. I’d like to hear some percussion out of it too. Are they actually using the ring for anything? not sure about that. Generally, I would prefer banana plugs for educational synths as the simplest approach for patching. Also, distinctive colour coding of inputs and outputs would be advised. Edit: Kilpatrick Phenol got it right. With a little bit of help from a metric ruler, I discovered I’d already began my first 2U modular system a few years ago with the Oplab. I could rack mount this eventually. I appreciate how the cute, foldable cardboard stand has iterated over the years into the use of sheet metal based chassis. TE take note! THIS is what we* want from Teenage Engineering Modular. I’m not exactly clear about what ‘we’ want… more cardboard chassis? Individual modules are forthcoming. Haha ! I’m vague. I would love a po oplab, and I hope that is one of the modules slated for their expansion. The op-z cv module is branded as opLab in a few pics that have popped up, not sure if that’s the final name for it. I’m hoping that means they’ll re-release the motion sensors.